Today's products, including the CasaTunes music server, are becoming increasingly dependent on the reliability of your Internet connection when playing Internet music, and on your WiFi network in your home. CasaTunes music servers use WiFi for AirPlay music, and to connect with the CasaTunes Apps running on one or more phones and tablets. Although most network protocols, including Apple AirPlay, have packet recovery built into the protocol, poor WiFi and/or Internet connectivity will often result in audio glitches, stutters, lack of control, etc, which can result in a frustrating experience for users. The good news is that Internet connectivity, at least in the US, is becoming increasingly reliable, and building high quality WiFi networks is now easier with the advent of WiFi mesh networks. The main advantages of using a WiFi mesh network is signal area coverage, and seamless hopping between nodes or access points in the network. Today, there are a large selection of WiFi mesh network products available on the market, simplifying building a high quality WiFi network for your home, regardless of the size of your home. Do not use a general purpose WiFi router in "Extended Network" or "Repeater" mode - Extended Network mode allows a WiFi router to extend an existing WiFi signal by repeating the wireless signal. As Apple® mentions in their support, if you use the Extended Network mode, “for this configuration, you may expect AirPlay drop-outs..”. Often this mode is used because there aren’t any ethernet cables going to the location of the second WiFi router. For best results, your WiFi router or access point should be connected to the network via ethernet cable, or you should use a WiFi mesh network solution which are designed specifically for this purpose. Do not use the WiFi network that is built into the DSL or cable modem supplied by the Internet Service provider - We often find these devices are not configured to route AirPlay packets (especially multicast packets), and configuring these devices, which often must be done by the Internet Service provider, can be challenging. Instead, we recommend you use one of the modem outputs to connect a separate WiFi mesh network based solution. This will allow you to implement a repeatable WiFi solution for customers, saving you and your customers, time and money. In the case where you are using a WiFi mesh network solution, replace the WiFi router with your WiFi mesh network base station. Avoid configuring multiple network segments - AirPlay relies on UDP and multicast packets which are typically restricted to a single network segment. If you must use multiple network segments, then we recommend that your CasaTunes music server, AirPlay devices, and your Android and iOS control devices, are all connected to the same network segment. Make sure there is only one DHCP server on the network - Your cable or DSL modem will typically be configured as a DHCP server, which means it is responsible for allocating IP Addresses to your network devices. This may, or may not be the best option for you. When configuring your network, you should have control over assigning static IP addresses to various devices (for example, we strongly recommended you assign static IP addresses for your CasaTunes music server, AV Receivers, and your AirPlay speakers and devices). If you have to contact and rely on your Internet Service provider every time you want to setup a static IP address, then it might be better to disable the DHCP server in the modem, and enable the DHCP Server on your WiFi router or mesh network to allocate IP addresses. In either case, it is important there is a single DHCP server on the network. Assign a static IP address for your CasaTunes music server - Assign your CasaServer a fixed or static IP address. We recommend you configure your router/switch/modem to reserve a static IP address based on the MAC address of your CasaTunes music server. How to reserve an IP address varies for each router/switch/modem, so you will need to check the manual. Assign a static IP address to your AirPlay speakers & devices - Assign your AirPlay spekears and devices a fixed or static IP address. Assign a static IP address to your AV Receivers - If you are using CasaTunes to power the music in a room using an AV Receiver, we recommend you assign the AV Receivers a fixed, or static, IP address. If you have an Android device, you can download a WiFi Analyzer app, for example, farproc. Unfortunately there is no equivalent tool for iPhones or iPads (yet), but you may find a good tool for your Mac laptop. However, the easiest solution is to find a cheap Android device and use it as another tool in your tool bag, just for your WiFi diagnostics. The main thing is that you want to know what routers are using which channels and their relative power while you are standing next to your AirPlay devices and at locations where your customer will be using their control apps. We have seen homes that have interference from WiFi routers located in homes next door, on the same channel and we have seen homes with routers placed in logical places, but with surprisingly poor coverage. Ideally, you want all of your WiFi signals at a signal level higher than -50 dB at all locations and with no other signals on the same channel. The only way you can be sure is to use an app that tells you what the power of your signal is. There are some other great network tool apps available for both Android and iOS. It is a good idea to check out your local AND your wide area network. Some of these apps let you see what your data rates are and how well you are connected. Often, it is a good idea to go into the WiFi router’s settings and change the channel in the 2.4 GHz band to a fixed channel, instead of automatic, to make sure you are in a clear area of the band. Signals on this band are actually so wide that they spread across several channels, so that the only truely clear channels are 1, 6 and 11. In the example image, above, the signal with SSID of “HDS1” is so wide that it actually interferes with all of the signals centered on channel 6 and all of the signals centered on channel 11. In fact, it also receives interference from those channels. Never use any channels other than 1, 6, or 11. 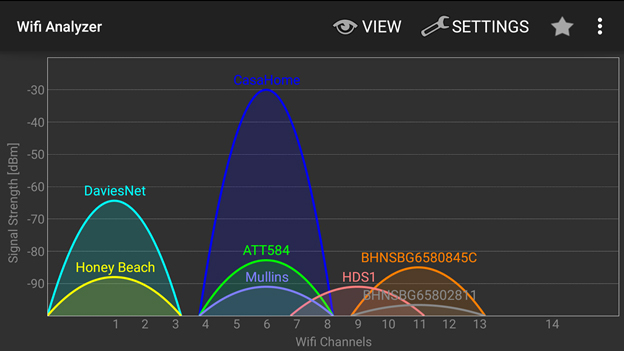 In the example, above, the router with SSID of CasaTunes was located about 10 feet from the device running WiFi Analyzer. Music Server Connectivity section - Measures how good the connectivity is between the App (your iOS device) and the CasaTunes music server. If you are unable to control CasaTunes, then check the number of GET and POST failures. If this number is > 10, then you are having connectivity issues. This is a sign that your WiFi coverage in your home may be spotty. 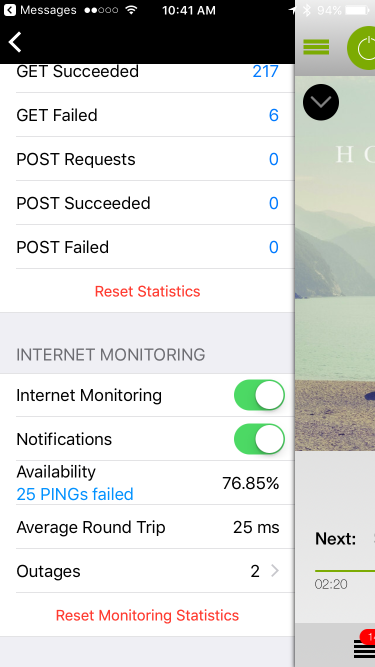 Internet Monitoring section - When enabled, CasaTunes will monitor your Internet connectivity and alert you when CasaTunes is unable to access the Internet. Internet monitoring uses a network PING to verify Internet access. This tool is useful in determining whether Internet connectivity issues may be causing music playback issues, when playing Internet based music.